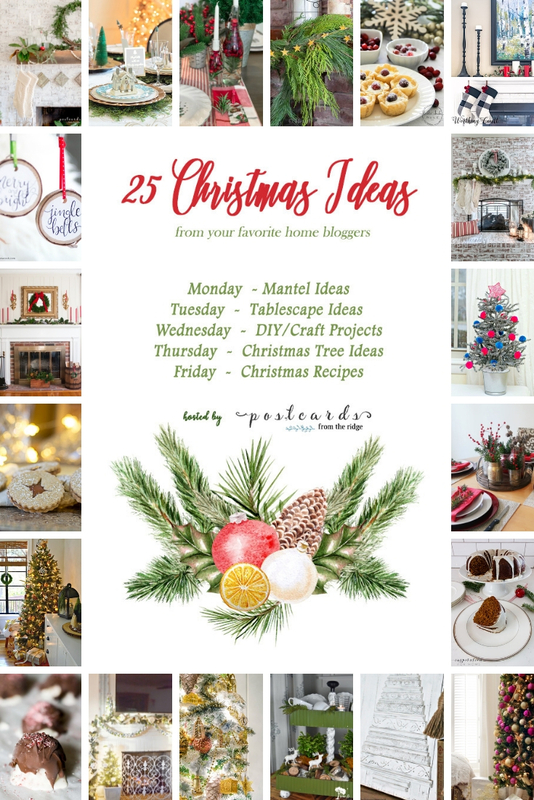 I am thrilled to be joining my friend, Angie from Postcards from the Ridge and 24 other bloggers to bring you 25 Christmas Ideas to get your holidays off to a great start. From Christmas Mantel ideas to Christmas Recipes and everything in between, I think you will find a great idea, inspiration or recipe from several of these talented ladies. Do make sure to pop over and visit them when you leave me today. You can find their links at the bottom of the page. Now, on to these Linzer cookies. Our family has their favorite cookies which get baked year after year. And that's a good and wonderful thing. But every now and again, it's good to add a new twist to the usual routine…am I right? Enter these Spiced Linzer Cookies with Pear Filling. And if I'm TOTALLY HONEST…this Linzer cookie recipe was made pretty much because I wanted to use my new Linzer Cookie Cutters. That's OK, isn't it? I mean, how do you not love a little window in a little cookie through which you can view the luscious filling. But then, baking Linzer cookies became a non-negotiable when an email arrived in my inbox a couple of weeks ago. It was an email from one of my favorite canners, Marisa from Food in Jars and the recipe she was sharing was for Pear Vanilla Caramel Sauce. I swear divine intervention was responsible and it was clearly destined that this sauce should be the filling for my Linzer Cookies. I'm telling you, it's that Kismet thing again!!! A lightly spiced gingerbread cookie was what I envisioned pairing with Marisa's Pear Caramel Sauce. For whatever reason, I have always felt that pear and gingerbread were made to go together. Is that a real thing or is it a pairing I've made up? So I took a classic Linzer cookie recipe and altered it by substituting dark brown sugar for granulated sugar and by adding those great, warming spices of cinnamon, ginger, allspice, and nutmeg. These lightly spiced and slightly sweet Linzer cookies are the perfect foil for the rich and flavorful Pear Caramel Sauce. Lightly spiced Linzer cookies are sublime when paired with this luscious pear caramel filling. Beat together butter and dark brown sugar until pale and fluffy, about 3 minutes with a stand mixer. Add flour mixture and process until just combined, about 1 minute. With floured hands, form dough into two disks. Wrap in plastic wrap and chill for at least 2 hours. Roll out 1 disk at a time, about 1/8" thick between 2 sheets of wax paper or lightly floured parchment paper. I also use my Silicon pastry mat. Once the dough is rolled out, refrigerate for 30 minutes before you cut it. Repeat with the second disk. Cut as many cookies as possible form the dough with your Linzer Cookie cutter and transfer to ungreased large baking sheets, arranging about 1 inch apart. You may also need to refrigerate after cutting your shapes and before you transfer them to the baking sheet if the dough gets too soft. Use cutter with the insert to cut the same number of cookies and place on a second cookie sheet. Refrigerate for 30 minutes before baking. Bake for 10-15 minutes total, switching position of the sheets halfway through the baking until the edges are golden. Transfer with a metal spatula to racks to cool completely. Spread about 1 teaspoon of pear filling on the flat side of a solid cookie and then top with the flat side of the windowed cookie. Marisa McClellan's Pear Vanilla Caramel Sauce is the perfect filling for the Spiced Linzer Cookies. Combine sugar with 3/4 cup water in a saucepan. Stir well to combine the sugar and pear puree and return the pot to a medium high heat. Make sure you are getting the bottom of the pot as you stir. Continue to stir until the sauce reaches a temperature of 225'. Remove from heat and add 2 TB of brandy, adding more in 1 tsp increments if it is too thick. Once assembled, the cookies get a finishing dusting of powdered sugar. 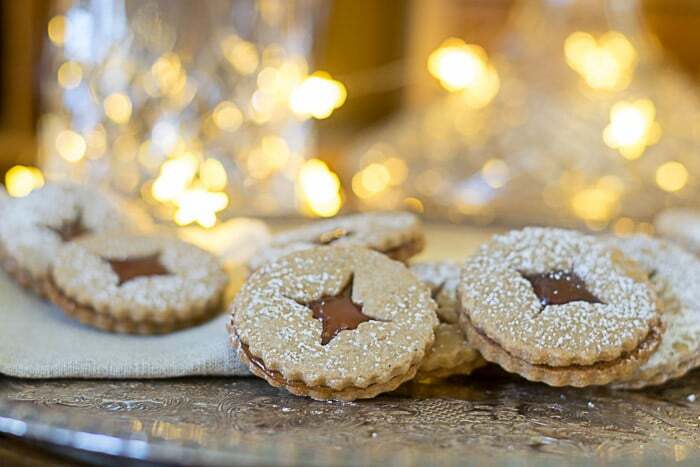 If you'd like to add this Spiced Linzer Cookie recipe to your Christmas Cookie repertoire, bookmark this page or pin the following image for your future reference. Now it's time to see more Christmas ideas from these talented home bloggers. Here's the tour lineup for the week. Be sure to visit everyone for wonderful Christmas ideas for the whole house. The links for each topic are below the images. Oh my Lynn, these sound utterly amazing and unique. I also love that they are gorgeous looking too. I’ve made my share of baked goods and dishes that taste good but don’t look so good. However, when they look so festive it’s a total bonus. Aw Patti…thanks! I have no doubt that whatever you make will be gorgeous AND delicious. Thanks for swinging by and hope you have a great weekend, my friend. Wow, Lynn. These sound amazing. I’ve never made linzer cookies but they’re beautiful. And your combination of pear and gingerbread sounds perfect. I might just be ordering some of those cookie cutters for a baking day with my girls. Thanks for the recipe! I love baking with my girl! Hope we will get a day of baking in before Christmas. Thanks again for organizing us my friend. Oh my goodness! These cookies sound absolutely scrumptious! I must make these this holiday season and I know that they would not last long at my house. Your cookies not only sound good, they are so very pretty. Good Morning Paula! They really do not last long…but they are so light that you don’t feel ‘too’ guilty! Have a wonderful day my friend. Lynn, these little cookies are so cute! And your pics are amazing as usual! Thanks Leen…I have fun taking the pictures…and eating the cookies! Those look beautiful … and sound delicious, too! I love the seasonal pear flavor! Thanks Randi, they have found their way onto the list of my favorites rather quickly! You make the most beautiful food. These cookies are a delish work of art. Can’t wait to try. Oh my sweet friend! I’ll bring my beautiful food and put it in your beautiful dining room and we’ll have quite a beautiful shindig! So pretty & I bet they taste amazing! Oh, they are definitely a brand new family favorite! Yum, these look so good! And that filling-what a unique combo. Pinned! Thanks Lora…it is quite delicious. Made some for my parents the other night and mom couldn’t stop raving about them! A new family favorite. Hey Michelle…and do you agree that pears and gingerbread are meant to go together? For whatever reason they are a Ginger Rogers and Fred Astaire pairing.